This top rated online dining etiquette e-learning course is used by corporations and professionals around the world. When you can't attend a live seminar the next best thing is our Business Dining Etiquette E-learning course. It is ideal for individuals who want to learn North American and Continental dining etiquette but do not have access to one of our seminars, for corporations that wish to provide an e-learning alternative, or for those who wish to brush up on their dining skills before an interview or important dinner. This is a five star rated course by the many people who have taken it. You want dining etiquette training but don't have access to a live seminar. 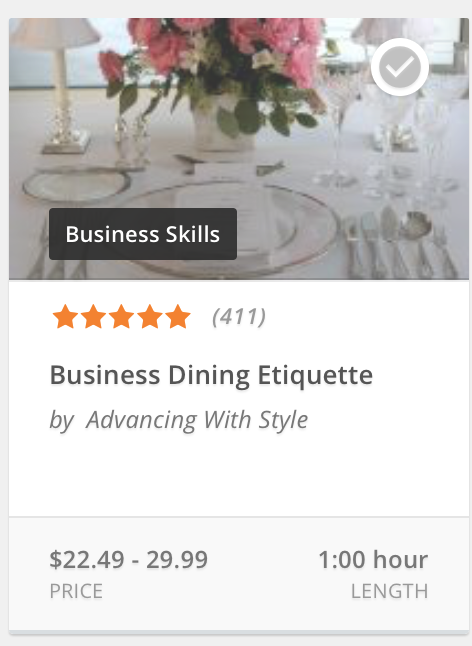 This highly rated online course is affordable and provides you with everything you need to know about business dining etiquette. If you have employees that can not attend an instructor lead seminar, you can provide them with effective and consistent training with our popular online Business Dining Etiquette course. This affordable course can be purchased on a pay per person basis whereby you can track the progress and completion of the course. You have the choice to purchase it for any number of employees. Please note that no LMS system is needed. The second way is to purchase a yearly license that can be downloaded as a SCORM file to use in any LMS. The Business Dining Etiquette e-learning course is 60 minutes long and covers all the information that is included in our instructor lead seminar. It is professionally narrated and includes a real time quiz at the end.